According to research, every 5th person is a chronic procrastinator – and 95% claim they’d love to quit the habit. So how do you stop from procrastinating? And more importantly, when is procrastination actually good for you? Piers Steel, a leading expert on the science of motivation, defines procrastination as “voluntary postponement of an unpleasant task, often against one’s better judgement”. Wadkins and Schraw (2007) further pursue that procrastination happens when we work on trivial tasks instead of urgent ones, or perform activities we enjoy rather than activities that we should or would like to perform. Chronic procrastinators – people who have constant problems to tackle or finish tasks on time. 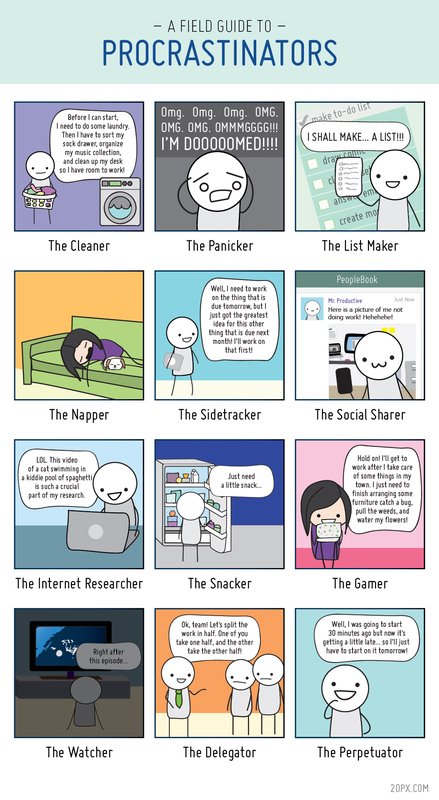 Situational procrastinators – people who delay work only on specific tasks. The underlying cause behind procrastination is low-self efficacy – when we don’t believe in our ability to finish something, we develop low self-esteem, which prompts us to procrastinate on said task. Ironically, on Reddit and Giant Bomb, most topics that cover procrastination are filled with people who are procrastinating while browsing the forums. One especially ironic example is a poster who learned what the word “procrastinating” even means while procrastinating on said forum. Writing papers a day before they’re due seems to be a usual occurrence – the longer the paper, the longer people seem to wait before tackling it. The most extreme example was postponing the writing of 4 separate essays until the very last day before the deadline for each – the problem was that it took the procrastinator in question too long to realize that all 4 essays were due the same day. Writing 22,000 words in 36 hours seems like a herculean task – but sounds less heroic when you realize that the person in question really had 4 months to finish the piece. A similar (yet less extreme case) was a poster who postponed a 10,000-word essay for the last 4 days before the deadline – despite initially being given 11 weeks to finish. One procrastinator realized he had to finish a 10-page paper before next morning – so he started writing at 1 a.m., finished at 5 a.m., and had but 1 hour of sleep, before going to hand over the paper. One university student had a good explanation for not handling in his paper on time – despite waiting two days before the deadline to start writing. After working on Saturday, he woke up on Sunday practically blind, due to an unfortunate combination of wash soap and forgetting to remove his contact lenses before sleep – so he couldn’t finish his work on time. In the end, his professor was understanding of his plights and extended his deadline, but this only shows that you can’t always count on the last day before the deadline to work. Looking up at a clock, and thinking: “Well I should have started days/hours ago, look at the time!” does seem to be the norm – but it doesn’t always have to end badly for the procrastinator, at least according to some confessions given at Reddit and Giant Bomb. One student always starts writing his essays around 2 a.m. and finishes them just before they’re due, say, at 7 a.m. He usually gets an A+ for the work he churns out that way. As a contrast, when he starts working on a writing assignment gradually, a week before the deadline, he gets a poorer grade. One class of students went over 5 hours of devising guidelines for their papers and 10-15 hours writing the papers – except one. This student spent 45 minutes in total on the writing assignment, and when the professor announced the results, it turned out that everyone had failed – except for the “slacker” student who managed to get a B. One other student had an especially inspiring excuse to help him cover for procrastinating on a paper. He did not start writing his paper until the morning it was due, and, though the deadline was set for one of the first classes of the school day, he showed up at the end of the day dressed in a formal suit and tie – to make the impression that he was at a formal event, and thus unable to hand in his paper sooner. He got an A. Apparently, it’s also possible to procrastinate responsibly – one poster followed the practice of putting off his homework in order to leave more room to perform the activities he enjoyed. But, he’d always make the effort to wake up earlier in the morning, to make up for lost time. Procrastinating while writing papers seem to be the most common – but there are other procrastination examples as well. A group of students had a history class that took place in a museum – and an assignment required that they all go to 3 more museums, interview employees and make summaries from their stories. One student didn’t have the means to travel to the other museums but also failed to make the effort to explain this to the professor. Instead, he made a powerpoint presentation about why the initial museum needs to create a better, more interactive website – as it turned out, the professor and the museum board spent some time prior discussing the same thing, so the student passed the class. One procrastinator had to write 80 pages worth of screenplay in one night – so he relied on 7 energy drinks in total to help make it happen. The final result of these efforts was a B+ – but such a large number of energy drinks is far from recommended, whatever you’re motives behind it may be. A writer had a 12,000-word contract for a children’s book – she procrastinated on it until the last day, and finished the book on midnight, only to go out immediately after. The first time the writer in question read the entire piece was after it was published. An employee in a company nearing bankruptcy eventually had to do 3-employees worth of work on a regular basis, because a lot of people got fired – but he had to continue working in order to qualify for a house mortgage. Once he did, he quit the job – but not before leaving behind 3 months worth of unfinished work. One woman spent 6 years refusing to pay a $68 parking fine, but she also never bothered to contest the fine, despite believing the parking sign mislead her into making the mistake in the first place. In the end, a police officer turned up to say she’d go to jail if she doesn’t pay the fine – which had since then built up to $6000 in total. One other poster was told that he was a procrastinator by a bag of fortune cookies – twice. He wanted to take his time going over a bag of fortune cookies to find the perfect one, but the first two that he drafted said: “Procrastination is the thief of time” – which is one of the most famous procrastination quotes of all time. Abraham Lincoln’s Gettysburg Address is a crucial moment in American history, as far as speeches go – and Lincoln finished the iconic address the morning he gave it. However, despite popular myths, he didn’t write it on an envelope during the train ride to the event. This delay in writing happened because Lincoln allegedly didn’t want to write anything down before he had formulated the speech in his head. So, he only finished his closing thoughts the evening before, and only finalized the entire piece at that very morning when the address was to take place. An apparent example of procrastination done right. Wolfgang Amadeus Mozart was the socialite among composers – he’d often go out drinking with friends to lavishing parties before premieres, and stay until late. And, for at least one composition, this seemed to be the winning formula. While they were out drinking and partying one night, it occurred to one of Mozart’s friends that Mozart hadn’t yet written an overture for his opera “Don Giovanni” – despite the fact that the premiere was scheduled for tomorrow. This prompted Mozart to savor a few drinks before going back to his room around midnight, to compose the overture – he managed to create a beautiful piece, and it took him only 3 hours to do so. But, his wife Constanze had to tell him fairy tales such as Cinderella, Aladdin and the like, in order to keep him awake long enough to finish. Leonardo Da Vinci is one of the most famous painters in the world today – but during his time, he was considered unreliable by peers and patrons. He’d start working on multiple projects, only to later abandon them, and he’d often fail to deliver on contracts – though he was commissioned to finish the painting Virgin on the Rocks in 7 months, it took him 25 years to do so. In 67 years of his life, he finished 15 paintings and a small number of architectural designs. However, his work is now greatly appreciated and his Mona Lisa is often considered the most famous painting in the world – as expected, it took no less than 15 years to finish. Victor Hugo, the famed French author was especially notorious for his procrastination – though he had a strict deadline to finish The Hunchback of Notre Dame, he managed to put off doing any real work for a year. When he was given another 6-month deadline, he turned to an unusual method to help him stay focused – he locked all of his clothes away and left himself with nothing else to wear but one shawl. Considering he had no clothes to go out in, he spent the remaining time before publication finishing up his book, naked. He managed to finish and publish the book two weeks earlier than the deadline. The Czech writer Franz Kafka used to blame his day job for taking away the time he’d otherwise spend writing – but, as it turned out, this was just a clever excuse. Kafka’s first job required he work from 8 a.m. or 9 a.m. until 2 p.m. or 3 p.m., which, in terms of day jobs of famous writers, was considered long. But, Kafka later left this job in favor of one that demanded fewer working hours, leaving him with more potential time to write. However, he’d usually use up this free time for a 4-hour-long nap, dinner with his family, a walk, and some exercising – even the time he’d spend writing mostly came down to writing letters or entries in his diary. And yet, he managed to write The Trial. Margaret Atwood the author of the now famed Handmaid’s Tale claims that procrastination is the reason she managed to write it (alongside with her other work). Her winning formula includes procrastinating the entire morning before settling down to work no earlier than 3 p.m. Such a routine seems to work considering she has, thus far, written 16 poetry books, 14 novels, 9 short stories, 8 children’s books, 10 non-fiction book – and even 2 librettos. He claimed to hate writing, and always procrastinated to no end. However, he eventually managed to produce 9 books in his lifetime – but only because he’d lock himself in a room and force his editors and publishers to watch over him, to make sure that he actually works. Truman Capote, American novelist, short story writer, playwright, and screenwriter, famous for books “Breakfast at Tiffany’s” and “In Cold Blood”, truly took procrastination to the extreme. One novel he signed a contract for, “Answered Prayers”, was scheduled to be finished by January 1968 – Capote even got a $25,000 as an advance for it. When he missed that deadline, the contract was re-negotiated to a trilogy of books, slated for completion by January 1973 – with $750,000 worth of an advance. But, time went by, Capote accused his lover of stealing the manuscript (though he later all but denied the manuscript even existed), and the deadline kept being pushed back. Eventually, Capote was so overwhelmed with other projects, personal problems, the unexpected success of his previous novels, as well as his own perfectionism, that he never managed to finish “Answered Prayers”. An unfinished version of the novel was published after his death. And, lastly, though it’s an unconfirmed, debatable matter, fantasy writer George R.R. Martin is often accused of procrastinating on finishing up the 6th installment, “The Winds of Winter”, in his well-known “World of Ice and Fire” book series… To the point that these “accusations” have become a running joke on the Internet, with people drawing up detailed timelines that show Martin’s procrastination process. Perhaps in an effort to put everyone’s minds at ease, Martin has recently disclosed his own method of beating procrastination – he goes to a remote mountain hideaway, doesn’t reveal his whereabouts to anyone, and then works on “The Winds of Winter”. Similarly, when he was finishing the previous book in the series a couple of years back, he forced himself to focus on writing by working “in a bunker” in New Mexico for a month. People around the world regularly practice procrastination – but, apart from making you brush with your deadlines, procrastination can also bring physical and mental health problems, as well as a poorer overall performance at work. According to one study, if you avoid making decisions and often postpone your work close to the deadline, you’re more likely to suffer heart diseases, such as hypertension – because you feel stressed over your unfinished work. For this study, Canadian researchers conducted an anonymous poll covering 980 people – and it turned out that a larger portion of people who postpone tasks for tomorrow suffered from hypertension than those that work on their tasks immediately. Procrastination can also influence your physical health indirectly – one article indicates that people who procrastinate in other areas of their life, also tend to postpone going to the doctor for medical treatments and diagnostic tests. Perfectionism leads to procrastination, and procrastination leads to stress and anxiety over coming too close for comfort with your deadlines – and these are the worst effects behind procrastination psychology. When you have a close deadline looming over you, you’ll feel anxious and stressed because you may not be done on time. Perhaps in an effort to excuse your tardiness, you may work on making the assignment perfect – and fall into a vicious circle, as perfectionism will likely hinder your ability to finish the said assignment in the first place. And, because nothing is ever perfect, you’ll feel anxious, stressed, which may ultimately lead you to depression. What’s worse you still won’t be satisfied with your assignments, and likely won’t hand it in any way. Apart from various health problems, procrastination may bring you poorer work performance, at least according to scientific studies. According to Tice and Baumeister (1997), evidence shows that leaving your work for the last minutes results in low-quality performance, as well as diminished welfare of the procrastinator. Ariely and Wertenbroch (2002) add that students who are prone to bouts of procrastination tend to get lower grades than their peers who start working on their assignments on time. Procrastination gets a bad reputation, for previously listed reasons – but despite it’s often mentioned detrimental effects, this phenomenon actually has some benefits. The sections “Everyday procrastination stories” and “World’s most famous procrastinators” listed earlier indicate some people manage to write bestsellers and score high on their papers, simply by postponing work until the last minute – because “being under pressure” actually inspires them. The entire idea stems from the Yerkes-Dodson Law which proposes that a certain level of arousal when we’re faced with a task can help you finish that task in a more satisfying manner. So, when we’re a little nervous (and we’re likely to be nervous over an assignment we haven’t done that’s due for tomorrow), it’s a sign that we’re anxious about our results, which will usually make us work harder for them. But, this is true only to a certain point – if you’re a nervous wreck, you likely won’t be able to think, let alone finish a task with flying colors. When you have only a day or a couple of hours before a deadline, every inch in your body is aware that there’s no room to slack away further- so you’re almost certainly going to focus your full attention on the task in question. In turn, there’ll be a lesser chance that you’ll get distracted, and your invested efforts and dedication is likely to help you make the most of your task. Once you immerse yourself in a task as minutes and hours go by and bring you closer to your deadline, you’re also likely to work faster. Avoiding work on one task may inspire you to work on another – in a desperate effort to avoid working on a difficult, complicated, unpleasant task you’ll likely shift your attention to other tasks, that may not be as important but are still on your to-do list. This reason is more of an indirect benefit of procrastination, a by-product of your “refusal” to tackle a task. So, if your “worst” task, or “frog”, includes organizing a lengthy meeting with your team over problems caused by a difficult client, then procrastinating on said task may inspire you to answer your emails, write an outline for a project proposal, think of a great idea for your next team-building outing, or simply finish some crucial private errands. You may not tackle your priority task, but you’ll clear your schedule for it for another day – when you’ll also be able to test whether you’re one of the people who perform work better when under pressure. Some people who fear they’ll fail, tweak their tasks to no end and worry about the possible outcomes – but only if they have the time to. Though perfectionism usually leads to procrastination, at times, procrastination can actually help you drop perfectionism – when you’re pressed with a looming deadline, you usually don’t have time to make something perfect. As a result, you’ll lower your expectations, but still perhaps score high – because you’ve dropped the impulse to make something perfect, and focused on the gist of your problem, you’re likely to have found the easiest and most effective way to solve it. As it turns out, many people, both the famous and the average Joes and Janes, procrastinate with their work, some actually thriving with their work, and some facing negative consequences – here are the most common reasons behind your desire to postpone or delay something and the best ways to stop. Micromanagement is often lauded as detrimental, especially at the office – but its polar opposite, lack of structure, direction, and supervision, leads people directly to procrastination. This doesn’t mean that all people are slackers by definition, who stop working as soon as there is no supervisor at sight – it’s just that a certain level of supervision and order goes a long way in encouraging people to be responsible and accountable with their work. Otherwise, people might fall into the well-known temptations brought to you by intriguing Facebook posts, funny Twitter tweets, and endless YouTube videos of cute puppies falling asleep. Studies on the topic of supervision, suggest it is somewhat necessary – according to the Hawthorne effect, people who know they are being supervised are more accountable with their work – and we can conclude less likely to procrastinate. So some level of supervision is crucial for overcoming procrastination. But, in order to avoid supervision turning into micromanagement, the best practice is to find the golden mean between the two extremes – if you are a supervisor, settle for providing some light guidance and advice, as well as clear instructions. When people are aware of what is expected of them, what their deadlines are, what skills they need to tackle a task, what rewards they’ll get for successful completion, as well as what are the consequence of potential failure, they get the necessary context for their work. Eventually, this information helps them make schedules, push forward and stop postponing work. Sometimes, a problem or task can be difficult and with seemingly no optimal solution. Other times, a task can be so lengthy and complicated that it threatens to take up most of our time. In any case, when we are faced with an unpleasant, lengthy or difficult task we don’t really want to do – we usually take our time before doing it. Luckily, there are ways around this. If a task is not only unpleasant but also unnecessary, feel free to eliminate it – you can do this for all tasks that aren’t urgent or important. Simply go over your to-do list every day, and find tasks you can eliminate, cut back on or minimize. If an unpleasant task is somewhat important and urgent, you’re advised to keep it on agenda, but you can perhaps delegate it. This can be a string of personalized emails you can ask a colleague to go through and reply. Or a sink full of dishes you can ask a family member to wash, as a favor you’ll return later. If you find a task unpleasant because it will take a lot of time to finish, call your friends or colleagues for help. For example, if you simply must clean up your basement (in order to avoid a rat or similar infestation in the future), ask for a favor from your friends. You’ll finish faster and likely find a number of fun artifacts hidden in corners you can all laugh over. In the end, to award your friends for their help, order a couple of pizza’s and set up a movie night with drinks. If a task is almost excruciatingly unpleasant, but unavoidable, try finishing it within a short time period, to get it over and done with as quickly as possible. For example, if you have to write a short, but detailed report select a day when you’ll tackle it, and simply power through. You’ll finish faster and feel the weight from your shoulders lifted almost in an instant. It seems that the more time you have to finish an assignment, the more you’ll feel at ease to procrastinate on it – this phenomenon stems from the hot-cold empathy gap that proposes that our future selves usually seem so distant that we feel detached from them in a way that makes it hard for us to understand just how stressed, tense, or under pressure we’ll feel when a future, distant deadline closes in. Or, as everyone’s favorite cartoon dad Homer Simpson would say: “That’s a problem for future Homer! Man, I don’t envy that guy!”. But, distant future tends to creep up on you, as you realize that the future always turns into the present and that you haven’t really done anything you were supposed to do. You may start by overestimating the time you have before a deadline for a task, and underestimating the time it will realistically take you to finish – for example, 2 months seems as enough time for you to finish a 15-page detailed research proposal, so you lay back, relax, and put off doing any real work on it. And, sooner that you know it, it’s 3 days before the deadline, and you’ve barely put together an outline – and you finally understand what’s at stake. To make sure this doesn’t happen and you bridge the hot-cold gap, you can make the deadline seem more immediate and closer to your “present” self – the best practice is to parse a long-term task into smaller, separate sections each marked by their own deadline and reward that awaits you upon completion. Sometimes you simply have too much to do – lengthy research proposal, filling out and sending a report to your supervisor, endless meetings, business lunch, 20 important emails to respond to… When you feel swamped, it sometimes seems much more convenient to duck for cover that to dive into all that work. So, instead of answering 20 important emails, you may find yourself rearranging your archived documents and cleaning up old computer files – which wasn’t in your to-do list, to begin with. To avoid feeling overwhelmed you can start taking time to plan your tasks – decide on the order in which you’ll tackle the tasks, decide when you’ll tackle them, and how much time you’ll ideally spend on each. Always make sure to define your bare minimum for the day – this is a task or two you’ll absolutely finish by tomorrow. Aim only to finish these crucial tasks, and do the rest if you have the time. Parsing your work into smaller chunks and more days will also help you feel less overwhelmed and more likely to focus – decide what you’ll do each day, and remember that less is always more. So, fewer tasks per day and a few dedicated hours each day will do. On occasion, you can work 2 to 4 each weekend – you’ll ease the workload for next week, but still leave enough time to enjoy typical weekend activities. But, make sure to be strict regarding your working hours – otherwise, the 2 to 4 hours can turn into the whole day you’ve planned to work, but procrastinated. In order to have a task assessed, people have to finish it and hand it over for evaluation – but many choose to procrastinate because they fear what results and feedback they’ll get. The longer you procrastinate, the more you’ll push back the moment you’ll get the results, whether they turn out to be satisfactory, excellent, average, or even poor. The problem here is not knowing what to expect. One deeper fear that stems from our fear of the unknown is the fear of failing – after all, if you don’t do something, you can’t fail at it. This fear is caused by low self-confidence, which leads to stressing over our some impending task because we don’t believe we are able to pull it off. To beat the fear of the unknown and fear of failure, first you need to redefine your goals – instead of making “reach success” your only goal, make “learn something new” your new goal. That way, even if you “fail”, you’ll have the positive benefits of having learned something from the mistakes that led you to results you’re not completely satisfied with. Another great way of beating fear in order to avoid procrastinating on a task is to visualize your potential obstacles – compile a list of all the potential problems you may encounter down the road, and think up solutions for them. That way, you’ll know you’re covered for all potential pitfalls, so it will be less tempting to procrastinate. The other side of fearing that we’ll fail is wanting to pursue a task to perfection. So, we make changes, additions, tweak it, and polish it – and we postpone the moment when we’ll call it quits. According to Hillary Rettig, and her book “The 7 Secrets of the Prolific: The Definitive Guide to Overcoming Procrastination, Perfectionism, and Writer’s Block”, people who strive for perfectionism have a fixed mindset – they fear that their tasks will fall short of perfect, so they postpone tackling them in the first place. To help get rid of a constant need to control everything and aim for perfection, the crucial step is to admit that you’re not perfect. Once you admit that you are not perfect, and that, likely, no one really is, you’ll be on the best possible road to take things easier, and stop postponing tasks – because you’ll know they don’t need to be perfect in the first place. Many experts have weighed in on the subject of procrastination – here are some expert tips from the best books on procrastination showing how to stop procrastination, or perhaps even learn something from it. In his book “Atomic Habits: And Easy & Proven Way to Build Good Habits & Break Bad Ones”, James Clear proposes that we deal with habits we seem reluctant to embrace by tackling them only 2 minutes at a time. So, instead of tasking yourself to “Read a book chapter each night before bed” task yourself to “Read one page of a book before bed”. Also, instead of tasking yourself with “Folding the laundry”, task yourself with “Folding one pair of socks”. The gist here is finding an easy pre-activity to start with, before going head-on into a challenge – subsequent activities can be more demanding, but it’s important to begin with something easy. This way, you’ll ease into a task, and be on the best possible way to tackle it right. In his book “The Now Habit: A Strategic Program for Overcoming Procrastination and Enjoying Guilt-Free Play” Neil Fiore recommends procrastinators to create “unschedules”, and prioritize their rest over their tasks. This is basically a time management technique with an unexpected twist – instead of blocking time for work activities (the ones you usually procrastinate on), block specific time in your schedule for non-work activities (hobbies, socialization, meals, exercise, other leisure activities…). Also, make sure to always schedule in at least an hour of a fun activity – and take at least one day per week off from work. “Unschedules” follow a system that you’ll want to pursue what you really have no time for, from all your scheduled appointments – and in this case, it’s your work. Once you fill your calendar with everyday activities, the small time frame you have left for your work will become evident – and you’ll realize that you don’t have nearly as much time for your projects as you originally thought, which will prompt you to use the unscheduled time in your calendar for work. The Procrastination Equation: How to Stop Putting Things Off and Start Getting Stuff Done, by the already mentioned Piers Steel, proposes that the key to stopping procrastination is increasing the right kind of balance for our motivation, value, expectancy, impulsiveness, and delay. First, always make sure that your motivation for work is higher than your motivation for distractions – for example, that you understand the importance of finishing up a project proposal to encourage your boss to promote you, over the importance of watching a fun, but random TV sitcom instead of working. Value of the task quickly follows – it’s your understanding of how much you enjoy a task and how much you’ll enjoy the promotion once you get it. Next, you need to assess your expectations, and how much you expect you’ll succeed on a task, and how much you expect to get the envisioned reward. What follows is your impulsiveness, or how likely you are to focus or get distracted. The last thing you need to consider is the delay between the present time and the time when you’ll have to hand over a finished assignment. For optimal motivation, work on finding a way to increase your task value and expectations and decreasing impulsiveness and delay – because higher value and expectations increase your motivation, and higher impulsiveness and delay decrease it.